The first hall has the scales, weights and measures used by merchants, folk medicine, votive offerings, breviaries, and other mementos of the religious life of the past, including a pleasingly naïf-style painting of Jesus and the Devil contending the soul of a dying man, who reluctantly resists temptation (women, games, money and music). The next section, located in the top floor, is devoted to domestic life, with the troughs and tools the farmers used to process the chestnut cop, the spinning wheels and carding tools used to process hemp (the women spun it so finely is resembled linen), the looms they weaved the cloth with, and examples of traditional clothing, some made entirely at home and some with, and examples of traditional clothing, some made entirely at home and some with cloth bought from itinerant merchants. The patterned blocks used to die the finished cloth are especially interesting. Basket weaving was also an important activity, undertaken primarily by the men during the winters, when it was to cold or to wet to work the fields; there are examples of the baskets they wove for use in the fields and of those they made to sell at fairs. There are also cooking implements, butter churns and molds, and\all sorts of other things including fish traps. While one would expect a fish trap to be plain and functional (and it is), the amount of care taken in decorating the objects used in the home, even the simplest, is simply astonishing. Descending a level there are exhibits devoted to the various trades. First the woodworkers, whit a selection of their tools, and, much more interesting, the furniture the cabinet makers produced. There are tables, surprisingly elegant chairs and couches that bring to mind Windsor furniture, and a number of beautiful cradles, made from faggio (a local wood) and died red with faggio sap to ward of the evil eye. They’re painstakingly carved with geometric patterns, especially stylized daisies. The next room is dedicated to stone carvers, who produced all sorts of things, from troughs to lintels. Again, the daisy is a common decorative motif, and you’ll receive a reminder of how frugal life was in the past from a\stone capital which, being carved and shaped was valuable, and was therefore hollowed out to make a mortar when it was no longer needed at the top of a column. 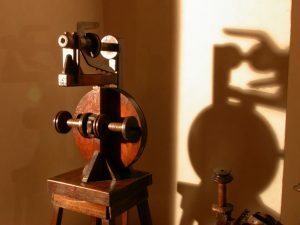 Smithing is next; most of what the smiths made was coarse, either shoes for horses and oxen or tools, but they did find time to make locks as well, and there’s a charming wrought-iron cradle that must have been some family’s happiest possession. We descend another level, into a room whit channels set into the floor that were used to direct the water to the mills until the 1950s. The room is now dedicated to the area’s wine-making traditions, whit the shears used for pruning, baskets, and bottling equipment. The next room is dedicated to the tools used to process wheat, and then there’s the mill itself, whit three millstones (for grain, corn and chestnuts) that were turned when the water struck the paddles of the wheels in the channels set under the floor. Milling was an abrasive task, and there are also the tools the miller used to dress his stones. There’s also another hall, which likely served as a storeroom in the past and now houses temporary exhibitions. 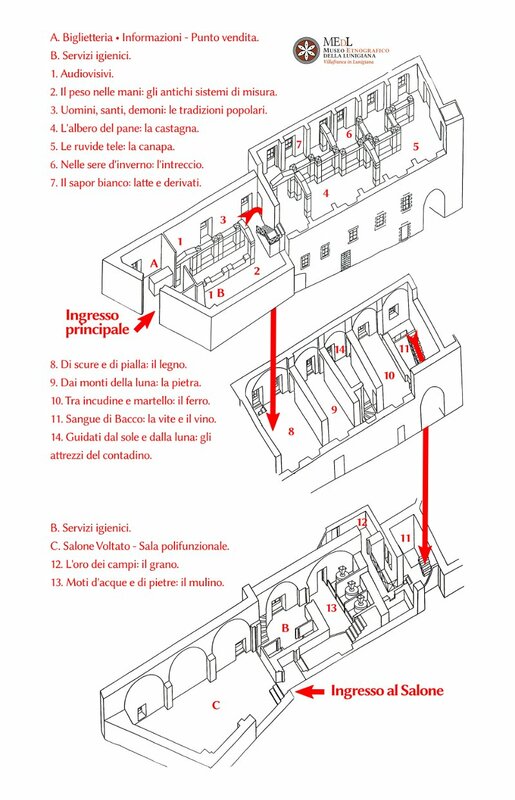 It’s a fun museum, ideal for children, and makes for an excellent day trip from Versilia, or Genova, or Emilia Romagna. 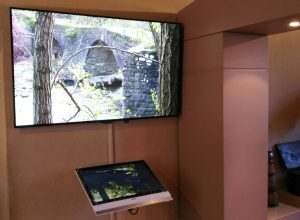 The museum has four touch-screen multimedia stations positioned in the various exhibition areas where visitors can see the large collection of audio-visual documents of the Municipal Library, consisting of digitized rare vintage photographs, video interviews, documentaries and audio interviews on culture lunigianese.